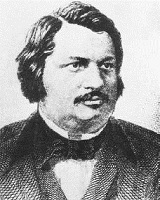 Honore de Balzac 20 May 1799 18 August 1850 French Bernard-François Balssa Anne-Charlotte-Laure Sallambier Novelist, Playwright A novelist, he was one of the most productive and creative writers of the nineteenth century from France. His deep observation of human life and behavior reflected in his complex characters and situations which came together from diverse backgrounds in a single story. A list of popular honore de balzac quotes are given below.